Employment was virtually unchanged in June (-6,400 or 0.0%), as gains in full-time work were offset by losses in part-time. The unemployment rate held steady at 6.8% for the fifth consecutive month. Following gains of 63,000 (+0.4%) in the first quarter of 2015, employment grew by 33,000 (+0.2%) in the second quarter. Full-time work increased by 143,000 in the second quarter, while part-time work declined by 110,000 over the same period. In the 12 months to June, employment increased by 176,000 (+1.0%), entirely the result of more full-time work. Over the same period, the total number of hours worked grew by 2.1%. In June, gains of 65,000 in full-time work were offset by losses of 71,000 in part time. Employment declined for youths aged 15 to 24 and increased for men aged 55 and over. There was little change among the other demographic groups. Provincially, employment fell in Quebec and New Brunswick while it increased in British Columbia and in Newfoundland and Labrador. Fewer people worked in ‘other services’ such as personal and laundry services and private household services, as well as in business, building and other support services. However, there were more workers in public administration. In June, public sector employment increased while both self-employment and the number of private sector employees were little changed. Adjusted to concepts used in the United States, the unemployment rate in Canada was 5.8% in June, compared with 5.3% in the United States. There were 26,000 fewer youths working in June, bringing employment for this group to the same level as 12 months earlier. The youth unemployment rate in June was little changed at 12.9%, as fewer of them participated in the labour market. For men aged 55 and older, employment increased by 24,000 and their unemployment rate fell 0.3 percentage points to 6.1%. In the 12 months to June, employment for this group rose by 63,000 (+3.2%), mostly a result of population aging. For women aged 55 and older, employment was little changed both in June and on a year-over-year basis. Their unemployment rate rose 0.5 percentage points to 5.4% in June, as more of them looked for work. Employment was little changed in June for men and women aged 25 to 54. However, on a year-over-year basis, employment for this group rose by 115,000 (+1.0%), evenly distributed between men and women. In June, the unemployment rate in this age group was 6.1% for men and 5.3% for women. In June, employment in Quebec decreased by 33,000, all in part-time work, pushing the unemployment rate up 0.4 percentage points to 8.0%. Prior to this decline, employment in the province had been trending upward since December 2014. Employment in New Brunswick fell for the second consecutive month, down 3,500 in June, contributing to year-over-year losses totalling 6,300 (-1.8%). In June, the unemployment rate in the province increased 1.2 percentage points to 10.8%. In June, employment in British Columbia rose by 15,000 and the unemployment rate fell 0.3 percentage points to 5.8%. On a year-over-year basis, employment in the province increased by 23,000 (+1.0%). Employment in Newfoundland and Labrador increased by 4,300 in June, pushing the unemployment rate down 1.5 percentage points to 12.3%. 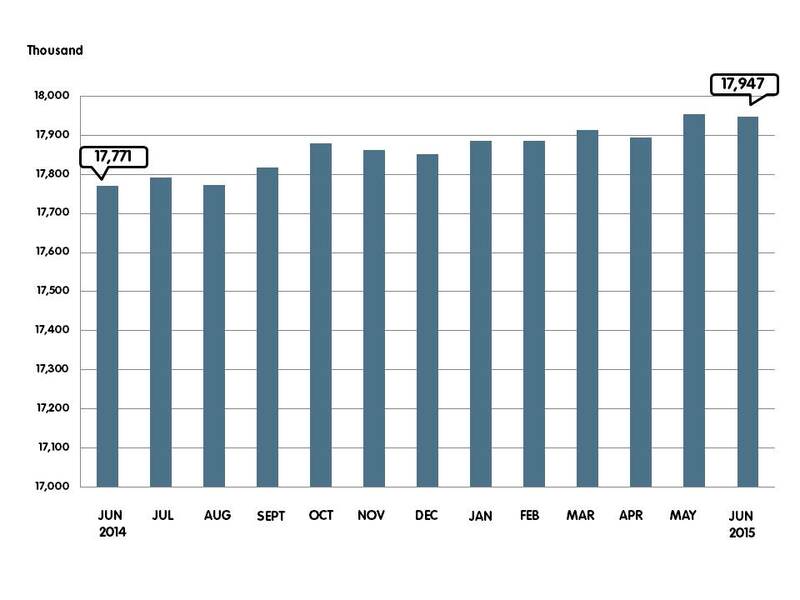 Despite more people working in June, employment in the province was little changed compared with 12 months earlier. In Ontario, employment was little changed and the unemployment rate remained at 6.5%. However, on a year-over-year-basis, employment grew by 92,000 (+1.3%) and the unemployment rate declined 0.8 percentage points. Employment was also little changed in Alberta in June and the unemployment rate was 5.7%. On a year-over-year basis, the unemployment rate in the province increased by 0.9 percentage points and employment grew by 1.0%, with virtually no growth in the first six months of 2015. From May to August, the Labour Force Survey collects labour market data about youths aged 15 to 24 who were attending school full time in March and who intend to return full time in the fall. The June survey results provide an early indication of the summer job market, especially for students aged 20 to 24, as many students aged 15 to 19 are still in school. The data for July and August will provide further insight into the summer job market for students. The published data are not seasonally adjusted; therefore, comparisons can only be made from one year to another. In June, the employment rate among returning students aged 20 to 24, that is, the number of employed as a percentage of their population was 67.2%, similar to that of June 2014. The unemployment rate was 10.0% for this group of students, down 1.7 percentage points compared with June 2014. The Labour Force Survey also collects labour market information about the territories. This information is produced monthly in the form of three-month moving averages. Data for the territories are seasonally adjusted, allowing comparisons with consecutive time periods. In the second quarter of 2015, employment in Yukon fell by 700 compared with the first quarter. This pushed the unemployment rate up 3.0 percentage points to 8.3%. On a year-over-year basis, employment declined by 800. Employment in the Northwest Territories was little changed between the first and second quarter and on a year-over-year basis. The unemployment rate was 7.1% in the second quarter. Employment in Nunavut edged down in the second quarter of 2015 compared with the previous quarter. Over the same period, the unemployment rate increased 4.8 percentage points to 16.8% as more people searched for work. Compared with the second quarter of 2014, employment was virtually unchanged. 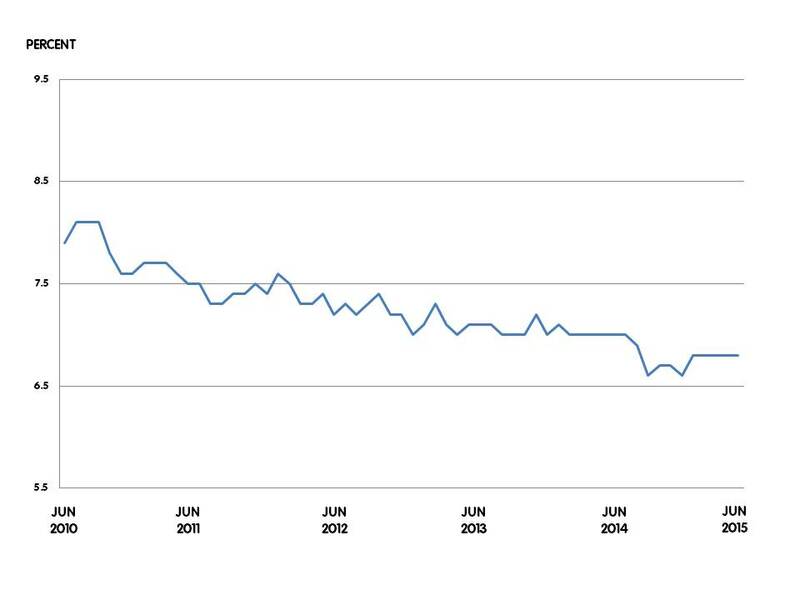 Adjusted to US concepts, the unemployment rate in Canada was 5.8% in June. In the United States the rate was 5.3%, the lowest since April 2008. Compared with June 2014, the unemployment rate in Canada declined by 0.2 percentage points, while the US rate fell by 0.8 percentage points. The labour force participation rate in Canada (adjusted to US concepts) was 65.7% in June, while in the United States it was 62.6%. In the 12 months to June, the participation rate in Canada and in the United States edged down 0.1 and 0.2 percentage points respectively. However, at 62.6%, the participation rate in the United States was the lowest since October 1977. In June, the employment rate in Canada (adjusted to US concepts) was 61.9%, compared with 59.3% in the United States. On a year-over-year basis, the employment rate was unchanged in Canada, while it increased by 0.3 percentage points in the United States.